I've been checking out The Purge TV series on USA. It comes from Blumhouse Productions, and stars Gabriel Chavarria, Amanda Warren, Lee Tergesen, Lili Simmons, Colin Woodell, & Hannah Anderson. The series takes it's nod straight from the films, depicting a various number of groups or people and the different turns their lives take during the night of The Purge itself. The show revolves around a 12-hour period when all crime – including littering, vandalism, murder, arson and theft – are legal, set in an altered United States ruled by a totalitarian political party, the series follows several seemingly unrelated characters living in a small city. "As the clock winds down, each character is forced to reckon with their past as they discover how far they will go to survive the night." 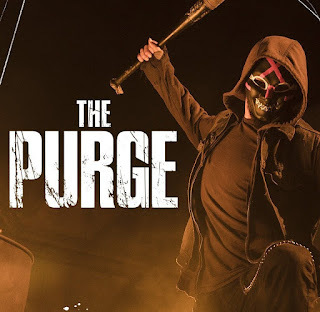 The Purge, in this world, is designed to help alleviate or vent the tensions of criminal activity by allowing crimes of any kind to be committed during an annual 12-hour period. AT first I wasn't sure where the show could go if they're based in the world of The Purge. Will they focus on the society or the event or what? It gurns out that the series takes place during a purge and we focus on four different parties and how they deal with this night or how this night impacts them and their families. After watching the first three episodes... oh wait... I have to say... the film series has constantly surprised me. Expecting it to be totally based on senseless violence, they always seemed to find an interesting undertone to the plot, making them better than expected. So if you liked the movies, I think you will enjoy this series. In the series, they have much more time to delve into the people and their back stories while we experience their present tensions and issues. We learn about people and their secret inner-purge lists, people that have ticked them off, people that just want to randomly attack who ever, or those who are anti-purgers, that go out into the night and strike down the purgers themselves. The stories of the people are pretty compelling, while the violence is there and peppered throughout each episode. I mean, this is The Purge. The season is focused on one 12-hour period, through the night of the purge. On IMDb the show has a 6.3/10. Will it be a hit? I think fans of the film series will like it, but it's only pulling in around 1.3 million viewers on average. That's not fantastic, but for a cable network, it might be enough for a second season. On the down side I believe those numbers come from it being aired on both NBC-owned networks, USA and Syfy. If it's being aired on two nets and getting only around 1.3 million, well, we might not see a second season. Heck, if it's bad enough, we might not even get to see this season finish out. But we'll see. Hey, if it's bad enough, the show itself will get purged, right?